Communication is a weird, asymmetric thing. It is really easy to realise that somebody is communicating badly, but it’s very hard to know this about yourself, and improve. Communication is important at different levels as well: from individuals all the way to large communities. You may have guessed correctly: the RuneScape community is just one of those communities in which communication is very important. I don’t think this is going to come as a big surprise, but let’s start with the basic premise: Jagex is bad at communicating. Most of you will not find this hard to believe, either because you’ve figured this out already, or because you’ve listened to some of our shows where we’ve talked about it. What you may not know, is that we actually discuss Jagex’s communication even more behind the scenes. This article is an attempt to summarise some of the patterns we have come to recognise that I, personally, think Jagex could significantly improve on. Let’s start with the most straightforward communication Jagex has: news posts. Update announcements have gone through many iterations throughout the years, but I don’t think they have ever been as bad as they are currently. Update announcements should introduce the update to players, in particular if they cause large changes to existing systems. Instead of getting to the point, they often start with a long ramble about something or another, before giving a long introduction to the update, often without actually explaining much. 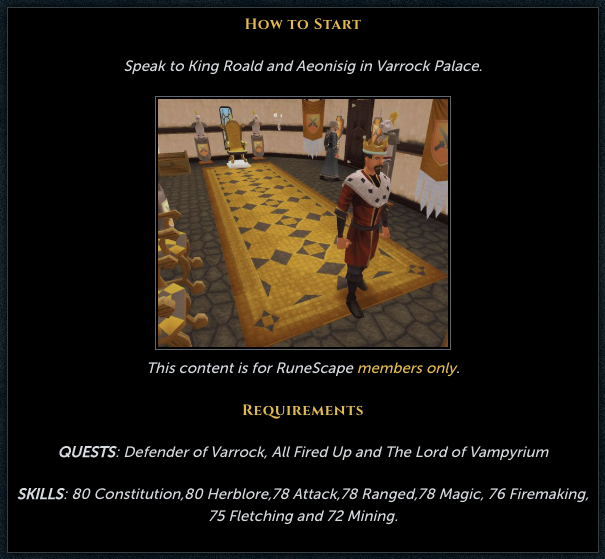 Years ago, update announcements would have a block in the news post summarising exactly what the requirements are and where to get started (see below). Now you have to scour the text and if you’re lucky, maybe you don’t have to open the wiki to find out what exactly you’re supposed to do. Each developer is different, and it is a valid choice to be a bit more mysterious about what content was added about the game, but does that really fit a game where players are actively asked to cooperate on the design of new updates? RuneScape’s playerbase seems to have moved past the point where they stumble upon new content organically by exploring the game world. While deciding whether that in itself is undesirable is a discussion we should have on its own, there is no reason in frustrating the playerbase as it is now by hiding the information players need somewhere deep down inside a riddle. In the recent months, Jagex has also started using their weekly update announcements to talk about livestreams and to announce in-game events. While I can definitely see the reasoning behind it, to me there is now always a long block of information at the bottom of the news posts that I only skim over. This has already led me to miss actually important announcements once or twice. Think about those endings of YouTube videos, where the channel asks you to like, subscribe, thanks their sponsors and Patreons, etc. I am sure most people tune out at that time. All the advertisements at the end of news posts do the same to me. All these things make news posts an ineffective communication tool. We are already at a point where visiting the wiki within an hour after the update goes out is more useful than reading the news post, and this makes me sad. What’s more, less and less people will read the news posts because they’ve lost their usefulness, which means Jagex loses the most important communication channel they have full control over! Then, if you can actually find the link to the patch notes, you’ll get exposed to a whole different experience. Patch notes can be a very important part of being transparent. Players want to understand when things change (especially when it comes to balancing); they want to see when that bug they ran into is fixed; they want to know Jagex cares about the small things as well as the big. The patch notes vary from clear and straightforward to cryptic. Often I find myself wondering what was actually fixed. I haven’t confirmed this, but it feels like the patch notes each week are copied from a shared document everybody just pastes their fixes in. That is something I would expect to be sent to the QA team (though one has to wonder how the QA team knows what to test in some cases), not something sent out to the entire community. A single person actually looking through these patches, make sure they’re written in an understandable way, would really help with making the patch notes a more useful resource. In turn, more people will go and read them and appreciate how alive the game actually is outside of the main updates that get the spotlight. Luckily community-led initiatives such as RSBANDB’s very own Weekly Byte help to do the hard work for the community, but really this could be much more easily done by those who have actually implemented the fixes. Before I fill an entire article talking about news posts, let’s consider one of the other important methods of communication Jagex has: livestreams. I will put aside my complaints about giving rewards to players watching the livestream, excluding all those people who cannot be around at that exact time every week due to other commitments (oh oops, I snuck it in anyway), and talk about their format on their own. Let’s be clear about one thing: Mod Shauny does a great job at managing the livestreams. He is often joined by the actual game developers though, and people who are good at game development are not necessarily good at the communication side of things. In game development, for every idea that gets implemented, there are at least a hundred ideas that do not. If you are excited about an idea and share it with one of the JMods, I promise you, they’re probably just as excited to build it as you are. However, it is important that the JMods work on what is most important for the game right now. In its attempt to be transparent with the playerbase, Jagex tends to share their ideas early, at a point where they may yet be modified heavily, delayed, or cancelled entirely. Meanwhile JMods have to give the playerbase a lot of “no” on all the suggestions that come in during a stream. Let’s look at a single example: recently Jagex announced that they would be buffing tectonic and sirenic armour significantly. A day later, this was off. Now you have two kinds of players: those angry about the overpowered buff, and those angry about the buff being cancelled. Compare this to a world where this discussion had taken place internally. A group of skilled people would have discussed the consequences of the change, and made a call on whether to implement it or not. In this case, the buff was cancelled, and the community doesn’t have to know: no harm done. That doesn’t mean Jagex can never communicate these explorations to the community, but it is incredibly important to be smart about how to do so. It often seems that all the JMods communicate outward without any filter. Are we at a point where the community knows about balancing fixes before Mod Timbo does? What is needed here is a filter: somebody who knows what they’re doing who can determine whether something is ready for sharing with the outside. I know the community appreciate the direct links with JMods, and I believe JMods also believe this connection invaluable, but if the JMods cannot keep their mouths shut when something isn’t ready for the community yet, then maybe those Twitter accounts and livestreams aren’t such a good idea after all. This idea of there not being any filter to the outward communication also shows in the manner and timing of communication. Several times I have seen large design proposals be announced during a weekend. Apart from exposing a bad habit to work outside of working hours, it is also unlikely that these design proposals have been reviewed by the team internally. Having a design proposal reviewed by a professional is going to be a better experience for everybody, so even in places where community interaction is of utmost importance, the method of communication must me given thought. I could go on much longer. We haven’t even touched on how Jagex communicates sensitive subjects such as RunePass and other micro-transaction related considerations, what happens on Reddit, and much more. However, I hope this article has given you a rough idea of the complexity of communication, and how Jagex could (and should) tackle these. The RuneScape community is loud and likes to yell about everything, but I think a lot of that comes down to a lack of understanding, bad management of expectations, and unfortunate choices of words or tone. RuneScape as a game is not in an unhealthy place; Jagex’s communication strategy however, could use some work. As opposed to RuneScape news posts, hopefully this article at least brings that message across.